One of the most exciting parts of preparing for baby to arrive is getting to design their nursery. However, it can also be really difficult knowing how to decorate it. If you’ve been staring at a blank room for months and you just can’t decide what to do with it, here you’ll discover some great tips, advice, and ideas on how to design the perfect nursery for your baby. Many parents make the mistake of focusing solely on the décor of the nursery. That is, the color scheme, what furniture will go inside and what overall theme should be used. However, the most important thing you should start with before getting carried away with the décor, is the location and practicality of the nursery. Ideally, you want the room to be as close to your bedroom as possible. That way, when your little one wakes up during the night, you won’t have far to go to comfort them. It should also be a quiet room of the home if possible, though remember – despite popular opinion, babies don’t actually need total peace and quiet to drift off. In fact, a little noise can make it easier for them to get to sleep. As for the practicalities, you mainly need to consider the warmth of the room and how much lighting it generates. Your baby should be comfortably warm, so adequate heating will be required. If the room lets in quite a lot of light, you’ll also need to take measures to ensure baby will be able to sleep during the day. You could install blackout blinds to help with this for example. It should also have plenty of space to house everything you’re going to need. For smaller rooms, there are practical space-saving nursery furniture you can invest in so the nursery doesn’t necessarily have to be huge. While it isn’t absolutely necessary, it does make it much easier if you can come up with a specific theme. That way, you’ll be able to focus much better on where you want the design of the room to go. It’s also a good tip to use a theme which closely matches the décor of the rest of your home, along with your personality. If it doesn’t, you’re going to end up getting pretty tired of it quickly and want to change it again. This is definitely a task you don’t need once little one comes along! Great tip – If you’re struggling for ideas for a theme, it could help to create a mood board. Take a look at magazines and online sites such as Pinterest, then save pictures of nursery themes you particularly like. You can put your own stamp on it by incorporating different elements from each of the designs you like. Typically, it’s common for parents to opt for the color of the paint they’re going to use first. This is logical as it’s the first task you generally want to get out of the way before all of the furniture is placed into the room. However, it’s actually better and less stressful to choose the color of your fabrics first. This includes things like your curtains, throws and baby’s bedding. So, why is it important to choose the color of the fabrics first? Well, you’ll soon discover there’s far less choice when it comes to the color of fabrics, than there is with paint colors. Many parents have painted the nursery, then found out the hard way that the fabrics they’ve gone on to choose simply don’t match the paint. So, by choosing the fabrics first, it’s easy to then find a paint color to match. This simple tip alone can save you a lot of potential stress. When it comes to adding furniture, the crib is by far the biggest investment you’ll want to make. It may seem like a lot of money to splash out on a crib, but you need to think that your little one will spend potentially up to three years sleeping in it. So, it makes sense to ensure you’re investing in a high-quality, solid model. Remember to choose a crib which meets all necessary US safety standards. Also consider whether you’re likely to have another baby in the next couple of years. If you are, it would be pointless investing in a crib which converts into a toddler bed, as new baby will need the crib once they arrive. You’ll also want to make sure the crib is gender neutral if you’re planning on having another one. It’s easy to get a little carried away with the furnishings for the nursery. After all, there’s so many cute and beautiful pieces you can include. However, over-decorating can actually cause a lot of issues once baby arrives. It can compromise the practicality of the space and make it appear much smaller than the room actually is. If you also keep the theme and furniture gender-neutral and not too “babyish”, you’ll avoid having to redecorate in the next couple of years. A great tip is to opt for wall stickers, rather than painting on baby-themed cartoon characters. That way, they can easily be peeled off when baby grows out of them and replaced with more age appropriate décor. We’ll actually be coming out with beautiful wall art in the very near future so be sure to sign up for our mailing list if you haven’t done so already! Few parents consider painting the ceiling, but it’s actually what baby will spend the majority of their time looking at. Creating a fun themed mural or simply painting the ceiling in fun, bright colors, can help provide a great distraction and grab baby’s interest when you put them down for a nap or just a rest. Besides the crib, a changing station is another important piece of furniture you’ll want to add to the nursery. You’ll spend a lot of time changing your little one and without a dedicated changing station, it can become a really stressful experience. Changing stations allow you to keep everything you need close by and within easy reach. They also give you a safe place to hold baby while you change them. So, if there’s just two pieces of furniture you invest in, make sure it’s a good quality crib and a changing station. 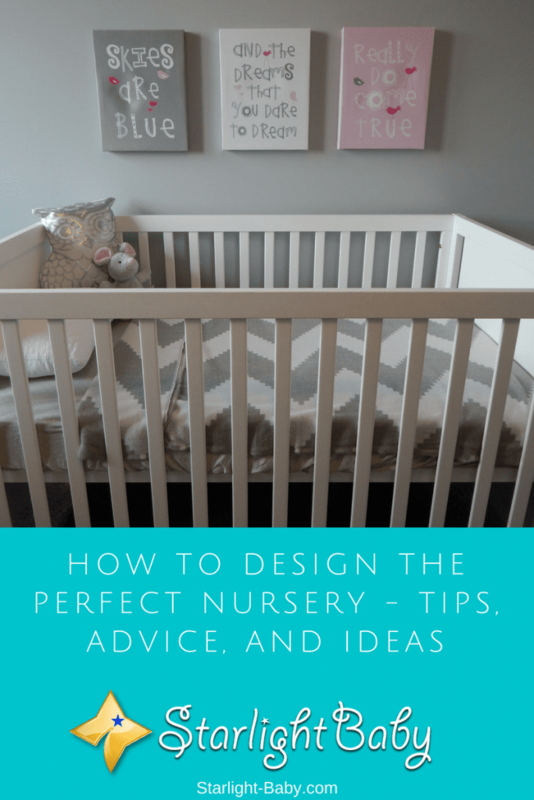 Overall, these are just some of the best tips and advice to help you create the perfect nursery. The actual décor and theme you choose should be personal to your home and your individual preferences. The key thing to remember is to ensure you’re making the nursery a practical room to use, as well as a visually pleasing one. I never thought of painting the ceiling, but it sounds like a fun project. I’ve heard of people painting stars on the ceiling and it sounds great. You’re *so* right about Pinterest… that place is a wealth of information and ideas for sure. You lucked out! 😉 Many others who opted to paint first ended up with a much worse fate hahaha. I had those glow-in-the-dark stars up on my ceiling up until the time I moved out. I remember my mom painting the rest of the ceiling like the solar system when I was about 7. It was really neat! I might have to do something similar in the future. Thank you for such informative article. I’m currently pregnant and already have one little devil that’s three years old. When he was born we didn’t really have the money to invest into making a nursery room for him so we just kept his crib next to our bed – BIG mistake. Now that we are financially well-off, me and my partner decided we will design a nursery for the future newborn. These tips are really useful because I honestly had no clue where to even begin… whether should I just paint everything and worry about fabrics and furniture later… or first get the furniture. I’m warming up to your idea of simply getting one of those wall stickers that are quite popular now and come in different themes. It seems far more convenient than having to paint motives on the wall ourselves. What about a nursery chair? Should we look into getting one as well or it doesn’t really matter that much? I don’t know if everyone else feels the way I do, but to answer your question about whether or not you should add a chair to the nursery, I’d say definitely. You’re going to be sitting there a lot… feeding the baby, tummyaches through the night, colds and fever, reading bedtime stories… a chair was one of my basic necessities for sure. When I mentioned a nursery rocker, my hubby asked if that wasn’t a little old fashioned… “a rocking chair? !” 🙂 But I’m glad I kept with my original idea because I don’t really think that another kind of chair would have worked nearly as well. I’d add here that all rockers are not the same… some are totally uncomfortable and some fit a body really well, so it’s something you’ll want to test out before buying. Agree with Katie, definitely get a comfortable chair if you can. It will be well worth it, and in my opinion worth spending a little extra to get something that really feels nice. I’d say make comfort and functionality a priority over looks. When you’re tired and it’s late you’re going to care about that a lot more. Very helpful interior designing advice. In my time when I was having babies, my husband and I couldn’t afford another spare room for coming babies. But our precious bundles did have a little corner of their crib, a rocking chair and a little lamp in our Master’s bedroom. My daughter is doing very well with this wonderful baby’s room decorating. Each child (two boys, less than 3 years old) has his own room in their house. If a new baby arrives, the two boys will have to bunk together in the oldest brother’s room, which, there is enough room for both. My daughter always keeps their rooms neat, secure, lovely, cozy and just perfect for little ones to sleep in and some quite naps during the day. Thanks you for your great tips! Sounds like it all worked out just as well and sounds like she has a great plan in place! Thanks for the tips,planning how to decorate a baby’s doom can be quite tiring if you don’t know where to start but I’ll be sure to consider and use the tips you gave. Thanks again. Glad we could help Liz! It can be really difficult when you don’t even know where to begin. Our writer really did great with this one – a lot easier to come out with a solid foundation and a plan, while also avoiding some common mistakes by following the advice here. This was a great article. Currently, I am designing a bed frame for my newborn son. It feels so good to be a father. He looks just like me. Therefore, he is superman! Wow! You seem to be enjoying your son a lot. Keep it up and spend as much time with him as you can. We’re glad the article helped you. I love it! This is cute. My wife sleeps with the four months old baby while I sleep on the sofa. We don’t have a nursery for our baby. I have a couple of times brought the issue of a nursery for the baby, however, my wife always dismisses this idea. Wife feeds the baby during the night, she changes clothes in case baby’s clothes are wet with sweat, she changes the cloth diapers when the baby soild the diapers. If the baby is left in a cot, there will be no one to take care of him, says my wife. She has valid reasons. Thanks for sharing these great ideas. When we are ready to build a nursery for the baby, we might use some of thes etips. I think your wife is worried about your baby sleeping alone so she wants him beside her at night. This is convenient for breastfeeding purposes because she doesn’t need to get up, but there is also a risk of suffocating the baby in case she falls asleep while feeding him. This is why some experts advise against the baby sleeping with its parents. You could probably start with a crib purchase. The crib can be placed beside your bed so your baby is at an arm’s reach. I really love all these tips, they are all certainly going to come in handy for my little kid sister who would put to bed in no distant time at highest in 3 months time. I will definitely make sure to pass across these priceless information to her on how to go about setting up here new baby born crib. How I wish I could be able to upload here baby’s picture to the blog when he finally gets to join us in the world and no longer just inside belly. One thing about setting up the perfect nursery for the coming baby is to ensure that the baby feels comfortable in it. I mean it won’t make any sense that some parents will spend much to decorate the nursery for the little baby while the baby will never enjoy a night of sleep there. So, that’s where your article on getting things right comes into play. Someone like me while a kid doesn’t like sleeping in total darkness, according to stories told my dear mom, and that made them put a little light bulb beside my bed to ensure that I enjoy my sleep always. Good point there, Henrywrites, about ensuring the crib is comfortable to sleep in. The baby may only grow restless if the crib’s bedding is not comfortable at all. That means spending sleepless nights while you try to figure out what’s wrong. Even adults can’t sleep in an uncomfortable bed or pillows, so how much more for the little ones. Location is important where it should be well ventilated area, baby friendly site and sunlight and fresh air available. As much as possible make the room simple yet elegant. Choosing the right and proper toys are important. Toys according to the baby’s age and which is recommended. Considering the material of the fabrics and bed is advantage for babies comfort in sleeping. For me this is one of the most exciting part in parenthood life. Choosing everything that we think is good for our babies but above most is their safety. I agree with you that making purchases in preparation for the baby’s arrival is fun and exciting. And yes, when doing so, parents should always go for comfort above all else – comfortable beddings, fabrics, etc. It would also be wise to not splurge on baby items because the baby grows fast and will outgrow them in a few months.